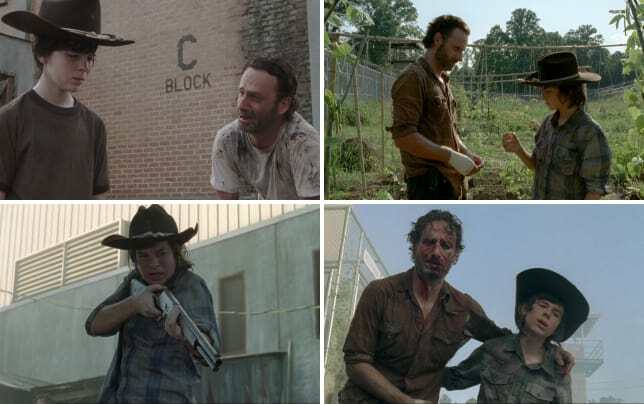 On The Walking Dead Season 5 Episode 12, Rick Grimes and his group entered Alexandria and slowly began remembering what life had been like before the zombie apocalypse. Is Alexandria too good to be true? That's what we're here to discuss. Join Eric Nordhoff from the Walker Stalkers, Sean McKenna, Whitney Evans, and Miranda Wicker as we decide whether or not Deanna Monroe can be trusted. What was your favorite quote or scene from "Remember?" Eric: We laughed out loud when Carol tried to play herself off as a happy homemaker. Hilarious! Sean: There was a lot of good stuff during this hour, but I enjoyed Carol coming out of the house with her new outfit and Daryl telling her she looked ridiculous. Such a funny moment. 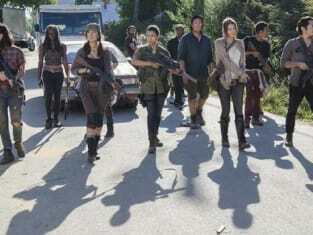 Whitney: This was a strong episode, but I loved Michonne's reaction to a clean-shaven Rick. I'd forgotten that she's never seen Rick like that because it feels like she's been part of the group for so long now. Miranda: This episode had so many lighter moments it's hard to pick a favorite. Carol was great. Rick shaving was great. Michonne talking about brushing her teeth for 20 minutes was great. BUT! I really loved seeing Carl interact with the other kids and realize that he's so not like them. I sort of liked the kid right then. What's Rick's best look: clean-shaven, slightly scruffy, or homeless beard? Sean: I'll go with scruffy Rick, I guess. Though it's wild that his amount of beard can be such a major discussion on a show about zombies. I mean, how intense was that shaving scene? Whitney: I'll go with clean-shaven because it brings back memories of Andrew Lincoln in Love Actually. Really though, he can pull off any look. Miranda: Scruffy Rick is definitely fantastic, but there's something about homeless beard Rick I really love. Do you trust Deanna Monroe? Sean: I feel so conflicted. I don't want to trust her, but I agree with Eric that she just seems so believable. All of Alexandria feels like the real deal. But I'm sure we'll see how she and the place really pans out soon enough. Whitney: I can't bring myself to trust her. The minute I do, she's going to disappoint me. I just keep thinking, when something seems too good to be true, it probably is. Miranda: I do trust her, but I don't trust that she's got as good a thing going there in Alexandria as she believes she does. I think that's why she wanted Rick to join the compound. She knows things aren't as good as she lets on. What's up with Jessie's husband? Eric: Yeah, I’m not quite sure. At first I thought Rick dreamed that. But, he might have just woken up thinking about that moment. Jessie would have mentioned it if they were happily married. She also inquired about his singleness, so I’m sure the marriage is not good - at best. That was probably the most intriguing thing about this episode. What’s Jessie’s intention with Rick and what’s the status of her husband, apparently named “Pete”. Sean: He's a creep. Just chillin in the shadows and calling out on Rick? You don't know who you're messing with, buddy. I'm definitely interested to see the dynamic between Jessie and Rick play out, but I'm sure her husband will be right there to cause problems. Whitney: I agree with Sean, he's definitely a creep! I think Jessie came home with a big smile on her face after hanging out with Rick and her hubby didn't like that very much. Miranda: I'm pretty sure there was a universal "Yeah, that guy's dead..." that went up when Jessie's husband spoke to Rick from the shadows. There's no way Pete makes it out of whatever's coming next alive. How long will it be before Daryl takes a shower? Sean: If Carol can't convince Daryl to take a shower, I don't know who will. Whitney: I can't see him ever taking a shower. He's never going to let his guard down in Alexandria. Miranda: Seeing Daryl in the midst of this Alexandria stay is so incredibly good. He's so out of his element among what would have been and in many respects still is such a nice place. I'm thinking he won't take a shower out of spite. Will staying in Alexandria make our group weak? Eric: There may be some that become weak, but I don’t think they will be there long enough to become weak. If anything, like Rick said, they will take the place before the place would take them. Great line, by the way. And a great way to finish this excellent episode! Sean: No. Not at all. Their experiences have made them who they are, and that won't go away. They also seem eager to keep honing their skills. There may be showers and video games, but like Rick said at the end, there's no way Alexandria will make them weak. Whitney: I don't think they will, as long as they allow themselves to get out beyond those walls once in awhile and remember the real war out there. They know better than anyone how quickly things can go from safe to not so safe and they won't get allow themselves to get complacent. Miranda: I'm not sure our group could ever become weak again. Living outside Alexandria's walls is too deeply engrained. Plus, it's not like the peace they're currently experiencing is going to last. 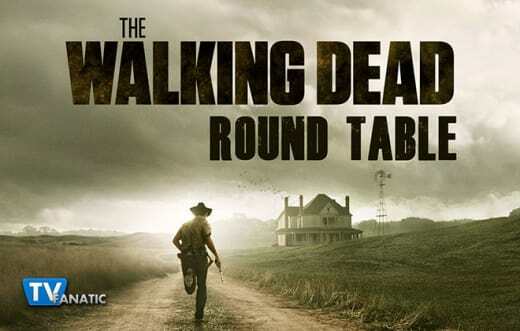 Catch up with Rick Grimes and the group on Sunday nights at 9:00 pm on AMC or watch The Walking Dead online right here at TV Fanatic. We'll do this again next week for The Walking Dead Season 5 Episode 13, "Forget."